A rare golden eagle rehabilitated and released last year from the Tufts Wildlife Center spent the summer around the Quebec/Labrador border, then returned to the New York/Connecticut area where it was originally found, new data has revealed. The eagle, which was found in Amenia, NY, by snowmobilers in February 2011, had sustained multiple puncture wounds on its left leg, likely caused by an animal it was trying to capture. It was also knuckling on its left foot, and was ultimately transferred to the Tufts Wildlife Clinic for treatment and released last March 25. 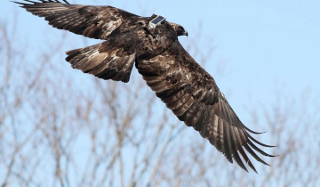 Prior to release, the golden eagle was outfitted with a GPS–GSM telemetry unit and a tracking band by Todd Katzner, PhD, a research assistant professor at West Virginia University, whose work focuses on tracking the migratory patterns of golden eagles, which, although not endangered, are rare in the eastern parts of North America. The tracking data has revealed the bird’s flight pattern over the past year. The State of Connecticut’s Department of Environmental Protection faciliated the transfer of the bird from a rehabilitator just over the CT/NY line to Tufts, as well as coordinating its release site. It’s extremely gratifying to all of us here at Tufts Wildlife Clinic to learn that this beautiful bird is doing well and living out its life in the wild, as it should be, said Dr. Florina Tseng, Director of Tufts Wildlife Clinic. It was a privilege to work with such a special bird and to be able to give it a second chance at freedom. During its stay at Tufts’ facility in Grafton, MA, a team of fourth-year students, veterinary technicians, veterinarians and volunteers led by Dr. Tseng treated the eagle’s wounds, splinted its injured foot, and prepared it for re-entry into the wild in the facility’s 100-foot flight cage. 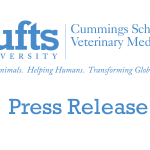 The Tufts Wildlife Clinic treats more than 1,000 wild birds each year, and is one of few stand-alone academic wildlife hospitals in the country. It serves as a regional resource for many veterinarians, health professionals, and wildlife biologists. Skills and knowledge are exchanged through programs of cooperative teaching and continuing education. The clinic contains all the latest diagnostic, medical and surgical capabilities to house and treat a broad range of sick and injured native wildlife. 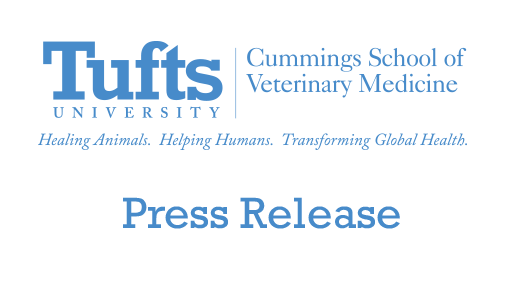 All veterinary students at the Cummings School are required to do at least one rotation at the clinic, which is funded by the veterinary school and private donations.